Amidst the pollution along the coast of Manila Bay, many species of wild birds try to survive. This kingfisher had just caught a small fish and perched on a rock to enjoy its meal. When the bird flipped its prey for easier swallowing, I let go of a long 10 fps burst with my 1D MIV to catch the decisive moment. Habitat – Coastal areas to open country, seldom in forest. Shooting info – Coastal Lagoon, Manila Bay, Philippines, September 17, 2009, Canon 1D MIV + EF 500 f4 L IS + Canon 1.4x TC II, 700 mm, f/7.1, ISO 400, 1/1600 sec, manual exposure in available light, 475B/3421 support. 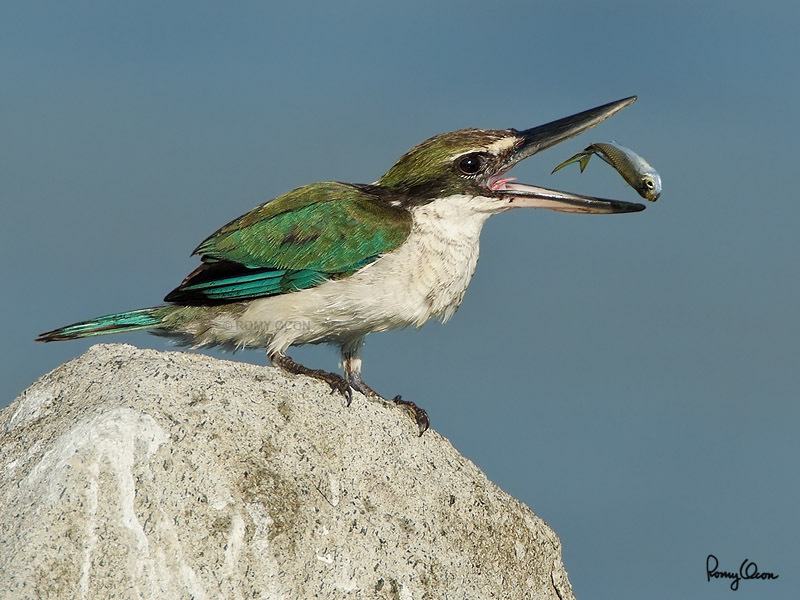 A short video of Collared Kingfishers filmed at Manila Bay.